There are a number of great boots out there that can help you avoid suffering from frozen feet while you are on your hunting or hiking expedition. 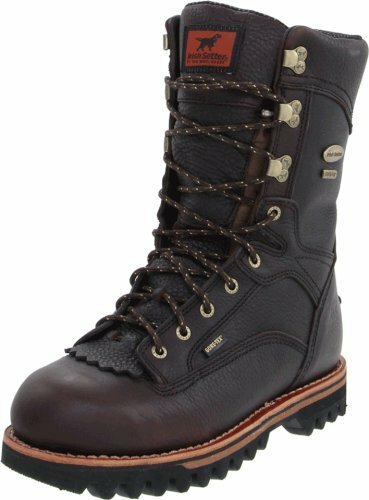 One such option is the Irish Setter Men’s 860 Elk Tracker Waterproof 1000 Gram Boots. In this post, we shall take a detailed look at all the major features that make the Irish Setter Elk Trackers one of the most popular hunting boots currently on the market. In addition to that, we will also be taking a look at the pros and cons and the most popular consumer FAQs about the Irish Setter Elk Trackers. 1.10.1 Q. Are these boots steel toe boots? 1.10.2 Q. Is it advisable to apply treatment to the boots just after taking them out of the box? 1.10.3 Q. Can I store the boots in plastic bags? 1.10.4 Q. What is the boots’ height? 1.10.5 Q. What is the weight? 1.10.6 Q. What is the shank made of? 1.10.7 Q. How do I clean the boots? 1.10.8 Q. Can I use soap to clean the boots? 1.10.9 Q. Who are the manufacturers of the boots? The Irish Setter Elk Trackers are 100% waterproof, which means your feet stay dry even when you find yourself slogging through mud, snow, water, etc. The boots include a GORE-TEX fabric lining, making the boot waterproof. The GORE-TEX lining is noted for its effectiveness in repelling liquid, which is the reason why many good waterproof shoes and boots utlilize it, and the Irish Setters are no exception! In addition to keeping your feet dry, these boots also do a great job of keeping your feet warm thanks to the fact that they are well-insulated. The 1,000 gram 3M Thinsulate Ultra insulation keeps your feet warm when you spend long periods of time in very cold temperatures. It is for this reason that many consider the Irish Setter Elk Trackers to be among the best boots when engaging in outdoor activities such as hunting in winter, winter hiking, shoveling snow, etc. Not many boots are both lightweight and durable, but the Irish Setter Elk Trackers are engineered with a sophisticated composite material that significantly makes them lighter while at the same time ensuring their durability. Four-way stretch nylon: provides you with flexibility as you walk. Memory foam: cushions every step you take. CuShin™ comfort tongue technology: reduces the pressure that the boot tongue puts on your shin while walking. The boots have synthetic soles, which also contribute significantly to their lightness. In addition to making the boots light, the synthetic soles are flexible and cushioning, thereby making the boots comfortable to wear. The boots are designed with the popular ScentBan™ technology, which kills odor causing bacteria. This keeps the interior of the boots free from foot odor and means you can wear the boots for several hours straight and they won’t develop any unpleasant odor. The boots come with a large toe box that offers a significant amount of space for your toes to breathe and feel comfortable. The Irish Setter Elk Trackers are well-built and very tough. Since the boots are waterproof, they keep your feet dry at all times. They are very comfortable to wear – especially during extremely cold temperatures. Capable of preventing foot odor from developing thanks to the ScentBan odor inhibitor. They keep your feet warm in cold temperatures thanks to their insulation. They have good traction which saves you from slipping in wet or icy conditions. Since the Irish Setter Elk Trackers are not steel toe boots, the wearer’s feet don’t get any protection from falling objects. The leather could be thicker. They are not snake proof. Because they are insulated boots, sometimes their interiors tend to keep in too much warmth during warm temperatures. Q. Are these boots steel toe boots? A. No. The boots are not steel-toed. Q. Is it advisable to apply treatment to the boots just after taking them out of the box? A. It really isn’t necessary since the boots are good to go when you take them out of the box. However, applying treatment to the boots will protect the leather from sun, snow, rain and salt. Q. Can I store the boots in plastic bags? A. No! You should not store your boots in plastic bags since that prevents the leather of the boots from breathing. When your boots do not receive air, they easily dry out or develop mold. Q. What is the boots’ height? A. The boots have a height of 12-inch. A. 4 lbs. 15 oz. Q. What is the shank made of? A. The shank is constructed of steel. A. You can simply use water and a piece of clean cloth to clean the boots before applying conditioners and a good leather protector. A. Yes you can. However, it is advisable that you use only non-scented soap to clean the boots. Q. Who are the manufacturers of the boots? A. The Irish Setter Elk Trackers are manufactured by Red Wing Shoes, which is a famous American footwear company founded in 1905. The company is best known for designing and manufacturing high-quality leather boots. All in all, the Irish Setter Elk Trackers are great boots that come with numerous advantages. Not only do they ensure that your feet are kept warm and dry during cold temperatures but they also have the ability to protect your feet from all sorts of elements. On top of all that, they are durable and very comfortable to wear. With the Irish Setter Elk Trackers, you can enjoy a comfortable winter hunting expedition without worrying about wet and frozen feet. I have a pair of the Elk Trackers and after only a few times wearing them they started to leak a good bit and the soles started to fall off. Had to glue them back together and put something on the outside to waterproof them. Very very disappointed after paying $230.00 for them. I highly doubt I would spend that much money again to get wet feet and have them fall apart.